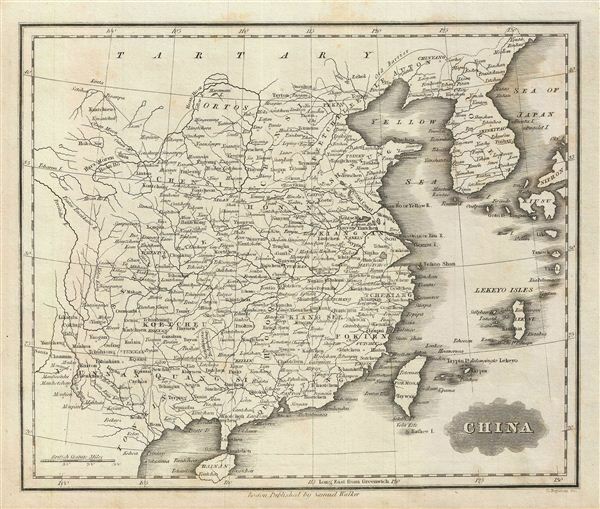 This is an attractive example of the 1828 Malte-Brun map of China. The map covers the region from Chinese Tartary in the north to Hainan in the south. The North Vietnamese empire of Tonkin (Tungquin), Korea, Formosa or Taiwan, and parts of Japan are also included. The course of the Great Wall is noted, however not named. The disputed body of water between Korea and Japan is here identified as the 'Sea of Japan.' In Formosa, or Taiwan, the old VOC trading post of 'Taywan,' modern day Tainan, is noted. Various, important rivers, islands, cities and other topographical details are noted. This map was published by Samuel Walker in 1828 as part of the American edition of Conrad Malte-Brun's System of Geography, Vol. I.